Is it possible, despite the reticence of the mainstream media to admit as much, that President Obama is capable of the occasional misstep? Recent events in Iran are exciting, to say the least. It is widely believed that last week’s presidential election in that country was rigged. This is by no means a unanimous opinion, but I, for one, am inclined to believe it. I saw four different opinion polls in the days leading up to the election. Of those four, only one pegged Mr. Ahmadinejad as leading, and even then it was by a mere percentage point. All the rest had Mr. Mousavi leading by a significantly larger — though still quite small — margin. In any case, given that there were four candidates running, a further run-off vote was to be expected. And yet, presto! Ahmadinejad ended up with an astonishing 60% of the vote, rendering a run-off unnecessary. No foreign observers were allowed to scrutinize the voting, and the votes were counted in record time, despite a remarkably high voter turnout. In my opinion, it all gives off a rather ripe odour. Still, it is possible that Ahmadinejad won, and that the polling somehow simply failed to track the real voter preference. Unfortunately for Ahmadinejad and Iran’s despotic “Guardian Council” of clerics, even if Ahmadinejad did win, he has in another sense now lost. The Guardian Council announced that although it would sanction a limited recount, it would not nullify the election results even if evidence of fraud is found. By taking this stance — which I understand they have subsequently softened — they thereby lost any remaining claim to democratic legitimacy. They revealed how little respect they have for their own “democratic” process, flawed though it is (for example, the Guardian Council vets all candidates before they are allowed to run). While history is being written on the streets of Tehran, President Obama’s voice has been cautiously muted, not venturing to do what, for example, Nicolas Sarkozy has done in calling the election a “fraud”. Now, I know that Mr. Obama has his reasons for adopting a quiet approach. He has had a long-standing policy of rapprochement with Iran, hoping to engage them in dialogue, a hope which he fears will be scuttled if he sticks his nose in Iranian domestic affairs. He reasons that, due to the troubled history of US-Iranian relations, it is best that the US stay out of the fray, lest it be accused of meddling. Unfortunately, the US is already being accused by the hardliners of meddling, and they always have been and always will be accused of meddling, because it’s all the hardliners have. They will make this accusation regardless of how the US conducts itself. So, Mr. Obama, you may as well go ahead and meddle. 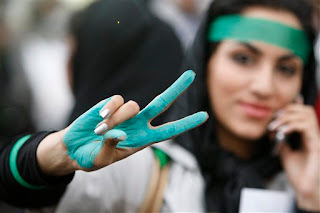 As much as it pains me to admit it, Mr. Obama’s critics are correct: the people on the streets in Iran could use the world’s moral support in their courageous effort to effect change. To fail to stand with them looks dishonourable and cowardly. There is a parade that is already underway in Iran. I would advise Mr. Obama to get in front of it before he’s too late. Good post, but I'm not entirely sure that I agree with it. Based on what I can see it looks like the establishment has decided to attempt to define the reformers as tools of the west (which is odd given the credentials of the alleged leader of the reformers). Given Obama's stance it seems that this isn't actually gathering much credence, instead the movement seems to be growing despite the influence of any of the major actors, and is looking more spontaneous than planned (i.e. there aren't any real leaders of the movement). Perhaps I'm blind here, but based on what I can see, the only folks who seem to be advocating a more involved stance from the USA seem to be the same folks who brought us such overwhelming victories as the Iraq War (Krauthammer et al.). There's definitely a difference between showing solidarity with the protesters through one's comments, versus some other kind of more substantive action; I definitely do not advocate the latter. I don't think there's much else constructive that can be done by the US in terms of action, so I'm definitely not advocating outright intervention of any kind -- that's not what I mean by "meddling". And I'm pretty sure taht the Krauthammers and McCains of teh world are not the only ones who would like to see a clearer stance taken by the Obama administration. (Incidentally, I think Canada could speak up a little more as well. Last I heard, our embassy in Tehran was closed, and unlike other nations' embassies, it wasn't giving refuge to protesters).